Der Artikel Camille Saint-Saens (1835-1921): Sonaten für Cello & Klavier Nr.1 & 2 wurde in den Warenkorb gelegt. Wiederveröffentlichung der Cellosonaten von Camille Saint-Saens. Als Zugaben spielen die Musiker aus dem Karneval der Tiere den »Schwan« in zwei Versionen. Eine vom Komponisten selber, die andere wurde von seinem Schüler Leopold Godowsky arrangiert. Saint-Saëns today has become one of those composers known through only a handful of works, but his output was prodigious and there is a great deal of music waiting to be discovered beyond Carnival of the Animals. Unfortunately his long life led to him passing from fame as one of the most naturally gifted musicians ever, to someone who had become passé with the arrival of the likes of Debussy and Ravel. This probably explains the neglect of so much supremely crafted music. 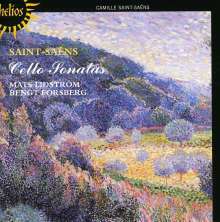 As a classicist Saint-Saëns was attracted to sonata form throughout his life and the two cello sonatas illustrate well the consistency of his compositional style over the 33 years that separate them, there is always a French clarity about the writing and also an irresistible forward momentum which comes from a directness in the structural plan which harks back to Mozart and Beethoven. By way of encores the disc offers two versions of the famous ›Swan‹ from Carnival of the Animals. The first was published by the composer before he allowed the release of the rest of Carnival (only published after his death), the second is an arrangement by pianist and Saint-Saëns pupil Godowsky for violin and piano, which has here been further transcribed for cello and piano.